Onychogryphosis a disorder that is characterized by the hypertrophy and excessive curving of the nails , also known as "Ram's horn nails  is a hypertrophy that may produce nails resembling claws or a ram's horn, possibly caused by trauma or peripheral vascular disorders, but most often secondary to neglect and failure to cut the nails for extended periods of time and is most common ly seen in the elderly . 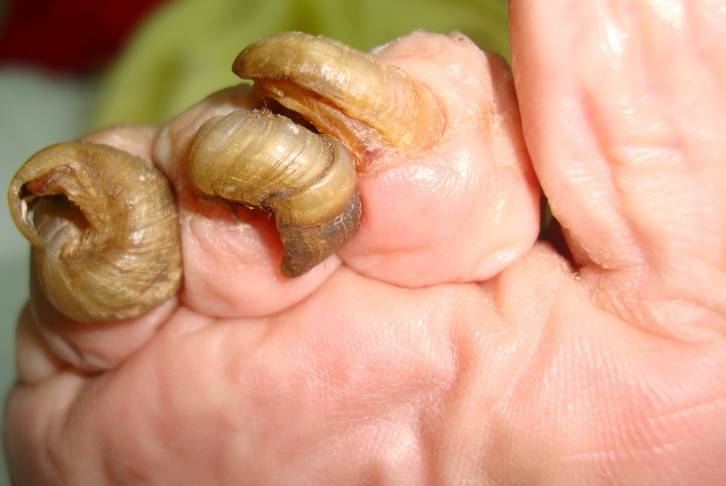 It can affect the fingernails and toenails  are seen in later life especially in the big toe-nail is severely disorted, thickened and interferes with the wearing shoes. 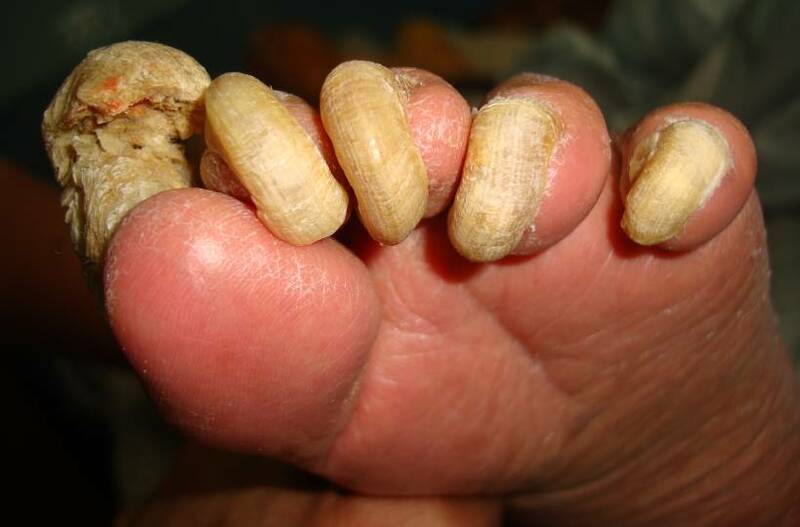 May be caused by poor blood circulation to the feet, diabetes, nutritional deficiencies and tight-fitting shoes, foot anomalies such as hallux valgus, old age, uricaemia, ichthyosis, psoriasis, onychomycosis, local injury to the nail apparatus, repeated minor trauma caused by footwear, pathology in the peripheral nervous system, syphilis, phemphigus and variola [1,4]. Etymology: Gk, onyx + gryphein, to curve, osis, condition  Onychogryphosis may rarely occur as a development abnormality but is usually acquired, its irregular surface is marked by transverse striations, sometimes this nail is oyster like. Appears in cases of self-neglect and is often seen in tramps and senile dementia. Idiopathic forms are acquired and hereditary . Conservative treatment is especially useful in feet at high risk patients with vascular disease and diabetes and trimming the thickened nail by means of an electric drull and burrs and the removal of subungual keratoses, chemical nail destruction using 40% or 50%, avulsion of the nail plate with surgical destruction of the matrix with phenol or the CO2 laser, if the blood supply is good. 2. Rapini, Ronald P, Bolognia, Jean L, Jorizzo, Joseph L: Dermatology. 2. St. Louis: Mosby 2007. 3. Berger JW, Elston T: Dirk. Andrews' Diseases of the Skin: Clinical Dermatology. (10th ed.). Saunders 2005.